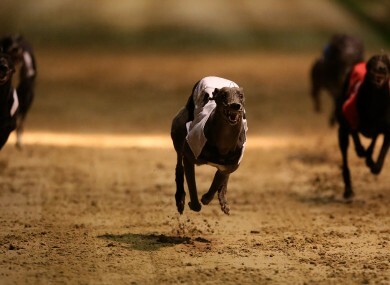 FOUR MEN ARRESTED in connection with the theft of a champion greyhound have been released without charge. Clares Rocket was stolen last Monday from the kennels of Irish Derby winning trainer Graham Holland. It has an estimated value of €1 million. The greyhound was then found safe and well, and four men were arrested in connection with the theft. Two were detained at Tipperary garda station, while the other two were held in Clonmel garda station. A Garda spokesperson told TheJournal.ie that all four had been released without charge, while a file has been sent to the Director of Public Prosecutions (DPP). Speaking to Seán O’Rourke on RTÉ Radio 1 yesterday, Holland described the incident as “a bit of a fairytale – it’s a bit unreal that it’s happened, you think you’re living a bad dream but it’s turned out very well for us”. Holland added that the incident brought to mind the horse Shergar, the prize-winning horse infamously stolen from Ballymany Stud in 1983. Prior to the robbery, Clares Rocket had been listed as one of the favourites for the English Derby. To date, he was won in excess of €53,000 through racing. Email “Four men arrested for greyhound theft released without charge”. Feedback on “Four men arrested for greyhound theft released without charge”.